I knocked up version 1 of this in the autumn, and it was OK, but had a couple of design faults which I have rectified overwinter. I don’t take credit for the initial idea, I got that from the Underwater Foraging book, but I love Wombling – getting something for free, making good use of redundant stuff, especially shed junk that should have gone to the tip long ago but will always come in handy. This dive float is very much in that category. Don’t spend too much money on this, if you have to start buying bits and bobs then you can soon end up spending almost as much as a purpose made float with the canvas pockets and the polystyrene inside bit. I have a few tips as to how you save money on this. Firstly if you are one of the tiny minority that doesn’t have a crappy bodyboard in your shed or a friend who wants to get rid of one, then go to a seaside campsite – they will have loads of them, especially at the end of the season. People arrive with an overflowing car, buy cheap boards for the kids, then, surprise surprise, no room at the end of the week to take them home. They only cost £8 each, it’s a no brainer, leave them by the big dumpster for the next family. The other expensive thing I found is the If you have a single board you will still benefit from extra leash plugs. These are the screw in things that enable you to attach all sorts of other cool stuff to your board, speargun straps, drink bottles, nets, camera, etc. etc. If you buy them online then they are a few quid each, so again, try a seaside campsite, they will have loads. I actually had a number of old boards which friends’ kids left when they visited on holiday, so I butchered these for the valuable leash plugs and velcro wrist bands. These are used to hold things like spearguns in place. The net is held in place by superglued plastic groundsheet pegs from GoOutdoors which are really cheap. These are a cheaper substitute for leash plugs if you have to buy them. The hole in the middle was there from version 1, but the net within it was fixed in place, which meant that with fish in the bag it had too much drag and wasn’t easy to pull around (sorry Richard!). 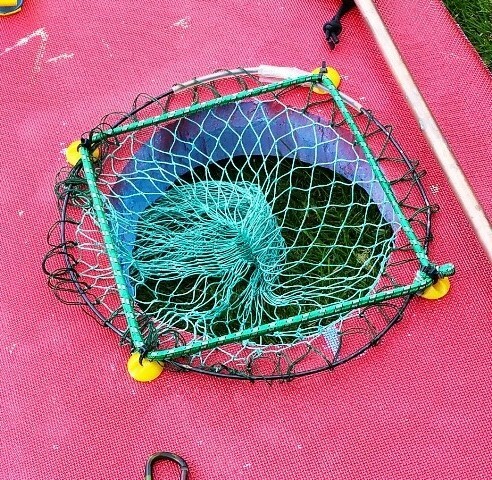 So I modified this so the net ring is held in place by bungee cords and at the end of the day you can unclip it to lay the net full of fish (hopefully) on top of the board, then swim back without it dragging in the water. (You can’t leave the fish on top for long or it will become a dinner table for seagulls. The net came from eBay. There was a guy selling an old stock of keep nets for £2 each (just the net, not the frame) so I made it worthwhile by buying 4 or 5 of them. They will come in useful in the future, and now I have taken a body board out there is space in the back of my shed for lots of other useful bits of stuff. The circular frame is from an old prawn net. The only dedicated piece of diving equipment incorporated into all of this is the line and reel, that came from spearfishingstore.co.uk but I would have bought that anyway, and I sometimes use it on a smaller float if I am not out to catch anything. The reel is normally attached to a loop on the top, but the line can be fed through a loop on the underside so it doesn’t get tangled in any of the paraphernalia attached to the top-side. I’d be interested if anyone else has a similar setup, or any tips and tricks that other people use on a bodyboard float like this. This entry was posted in Diary, freediving, Marine Foraging, Spearfishing, Wetsuits & Gear and tagged freediving float, Spearfishing, spearfishing float on May 19, 2015 by mybluejourneyeditor.